This is an excellent opportunity for folks from our last stunt kite clinic to "level up" the information they absorbed in June, as well as to receive the key tips they need to perfect whatever tricks they added to their repertoire in the meantime... We will still do the "stunt kite 101" for first time attendees or those who wish to experience it again, but we'll also keep at least one master instructor available during that timeframe (either Scott Weider or Paul de Bakker) to assist folks who would rather get right to flight exercises, we'll also try to incorporate more opportunities for group example and exercises in the interest of improving the learning experience for everyone, as well as a bit more scheduling (so we all know a bit more what to expect). Apologies in advance, this clinic has been canceled due to lack of sign ups - that being said, Scott Weider, Paul de Bakker and myself look forward to planning the same type of event later this year or early next. As always, big thanks to all who showed interest, we’ll see you somewhere, the learning never stops! Any interest in a Prism Legacy in mint condition? 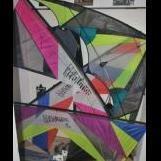 Decided to keep the kite.